A gravity filter can be used with water that has a low to medium concentration of suspended solids (10 to 100 ppm). With this device, the water flows by gravity through a screen with a mesh size of 100 to 200. Contaminants are collected in a trash tank and must be removed periodically by hand. One design uses rotating jets to keep the screen free of debris; one manufacturer requires a pressure of at least 30 psi for operating the cleaning jets. Another design installs the screen at a steep slope to keep it from clogging. Because water must be repressurized following use of a gravity flow screen filter, the pumping and energy costs should be considered. 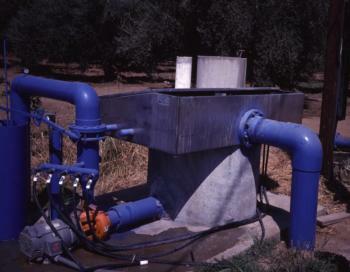 These filters are most often used where water is delivered to the field via a buried irrigation district pipeline having enough pressure to deliver the water flow over the filter screens. A secondary booster pump then pressurizes the infield system.